Greater Philadelphia Bicycle News: Social History of the Bicycle - Exhibit Debut Tonight! Social History of the Bicycle - Exhibit Debut Tonight! 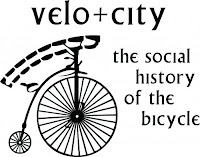 Tonight, Rittenhouse Square’s most extensive print gallery opens Velo+City – The Social History of the Bicycle. Presenting a stylistically diverse and graphically compelling collection of original prints, vintage posters, and ephemera, this exhibition visually details the rise of the bicycle over its 150-year history. The works follow the bicycle’s development from a dangerous object of ridicule and plaything of aristocrats to a democratized form of leisure and transportation for all. Historical information will be presented, providing context for the images. All artwork is available for purchase. A special opening featuring live music from The Extraordinaires and Tavo Carbone and refreshments will be held from 6-9pm.